- Have fun dancing in a relaxed and comfortable enviroment! 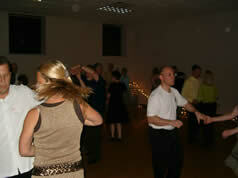 - Try out your new dance skills and meet some fun people who enjoy dancing as much as you do. - Don't forget to explore shops, restaurants, and the parks of Hudson before you enjoy your evening dancing! January 5th - Variety Dance! . . . . . . . Lesson: Foxtrot & Lindy Hop! January 19th - Variety Dance! . . . . . . . Lesson: Salsa & Bachata! February 2nd - Variety Dance! . . . . . . . Lesson: Tango & Cha Cha! February 16th - Variety Dance! . . . . . . . Lesson: Nightclub 2-step & Hustle! March 2nd - Variety Dance! . . . . . . . Lesson: West coast Swing & Rumba! March 16th - Variety Dance! . . . . . . . Lesson: Waltz & (East Coast) Swing! April 6th - Variety Dance! . . . . . . . Lesson: Tango & Samba! April 20th - Variety Dance! . . . . . . . Lesson: Country 2-step & Triple Swing! May 4th - Variety Dance! . . . . . . . Lesson: Salsa & Merengue! May 18th - Variety Dance! . . . . . . . Lesson: Waltz & Night Club 2-step! June 15th - Variety Dance! . . . . . . . Lesson: Rumba & Triple Swing! July 20th - Variety Dance! . . . . . . . Lesson: Tango & Cha-Cha! Aug 17th - Variety Dance! . . . . . . . Lesson: Night Club 2-step & Hustle! Sept 21st - Variety Dance! . . . . . . . Lesson: Foxtrot & Samba! Oct 5th - Variety Dance! . . . . . . . Lesson: West Coast Swing & (East Coast) Swing! Oct 19th - Variety Dance! . . . . . . . Lesson: Country 2-step & Cha-Cha! Nov 2nd - Variety Dance! . . . . . . . Lesson: Tango & Hustle! Nov 16th - Variety Dance! . . . . . . . Lesson: Salsa & Bachata! Dec 7th - Variety Dance! . . . . . . . Lesson: Waltz & Viennese Waltz ! Dec 21st - Holiday Variety Dance! . . . . . . . Lesson: Rumba & Swing! Copyright Ballroom & Wedding Dance Studio. All rights reserved.